Brussels City Centre, Belgium, 1 November 2017- HotelsCombined, the Australian-based hotel metasearch company, has started an extensive survey covering different types of accommodations within the Belgium. 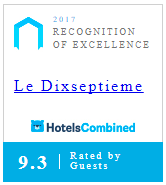 This survey is based on gathering data from millions of guest reviews, and translating them to an official Recognition of Excellence. reviews for an impressive rating of 9.3 out of 10.